Surgeons at John Radcliffe Hospital, Oxford, have carried out the world’s first internal eye operation using a robot, remotely controlling the machine to lift a membrane 100th of a millimetre thick from a patient’s retina. The Robotic Retinal Dissection Device (R2D2) is designed to mitigate against tiny tremors in surgeons’ hands, which can even be caused by their pulse. Built by Dutch medical robotics firm Preceyes BV, it has seven independent computer-controlled motors and acts like a mechanical hand. Using a joystick, a touchscreen and an operating microscope, the surgeon’s movements are converted into robotic manoeuvres as precise as 1000th of a millimetre. In this instance, Professor of Ophthalmology Robert MacLaren entered the eye of Reverend Dr William Beaver via a hole less than 1mm in diameter. The 70-year-old priest had a membrane growing on his retina that was distorting his vision. At just 100th of a millimetre thick, this membrane had to be dissected off the retina without damaging it. The operation has so far been a success and Father Beaver’s vision is improving. “There is no doubt in my mind that we have just witnessed a vision of eye surgery in the future,” said Professor MacLaren. 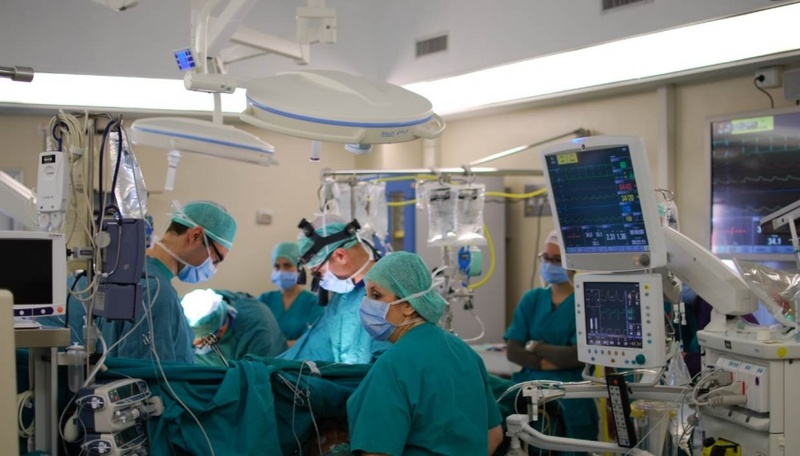 These operation include surgical treatments for blindness, such as stem cell gene therapy where the cells need to be placed under the retina with a high degree of accuracy. R2D2’s trial will involve 12 patients in total, with the surgery increasing in complexity as the trial progresses. The next phase will test the robot’s capabilities in placing a fine needle under the retina to inject fluid, which in turn could pave the way for gene therapy with the potential to treat certain conditions that cause blindness. The trial is sponsored by the University of Oxford and funded by the NIHR Oxford Biomedical Research Centre, with support from Oxford University Hospitals NHS Foundation Trust, and additional funding from Dutch blindness charity Zizoz. Sadly, I suspect there are already teams of ambulance-chasing lawyers poised to make their conn-tribution to this ascent of man! But when clerks (no matter what titles they give themselves, that is what they are) gain (as they have done) complete control over so many pivotal aspects to our technology based society what else do you expect? Many years ago, I had the opportunity to explore this concept with a clerk (he was called a divisional director, and worked for what was GEC.) Lord Weinstock was busy ‘rationalising’ that firm (a polite word for reducing much of its (and our nation’s) proper manufacturing. My point was that in the ultimate, the firm would be reduced to Lord Weinstock sitting in front of a bank of computer screens, linked to every stock-exchange in the world, trading promises! I did point out that amongst the jobs that would be going was that of the clerk I was talking to. Professor Dr. Peter Stalmans at Gasthuisberg Hospital in Leuven (Belgium) performed the world’s first internal eye operation using a remotely controlled robot on January 25th 2017.